The mailman delivered a large box addressed to me on Friday. My birthday was in late December. Since I didn't remember ordering anything, I was surprised. Note how huge- compared to can of corn. My mom's sister doesn't usually send me gifts for my birthday. She isn't my godmother, and in our large family buying adult children a gift is typically reserved for godparents. Not that it was my birthday anyway. To my knowledge I've never received a birthday gift from a godparent. Compared to my siblings, I totally lost the lottery in the godparent department, but that's a whole other story. 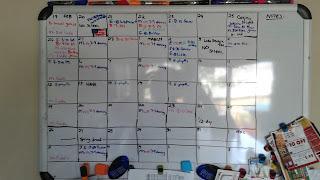 Magnet jobs just removed from command central to make room for more activities on the calendar. Cute, right? Or was I supposed to read between the lines? To call Aunt Patricia a neat freak would be a major understatement. She's more over-the-top than that. Grand-kids are forewarned not to touch her walls. Guests fear repercussions from dropping crumbs. If it was socially acceptable to leave plastic on furniture, she wouldn't hesitate. I'm not one to hang lots of cutesy messages in my house. We manage to survive without reminders like: 'Our family rules: laugh often, love always' or some other generic load of crap. Not really my style. Magnet jobs were posted here until recently. 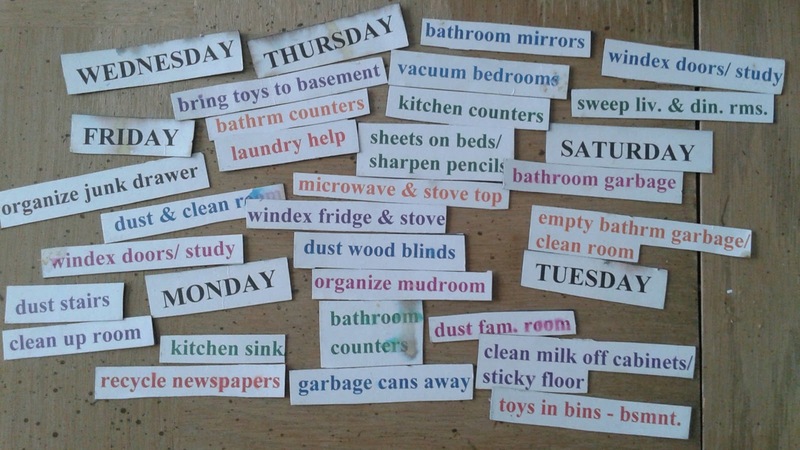 I'd rather reserve precious wall space to post legitimate chore reminders as opposed to run-of-the-mill upbeat family catch phrases. I tailor my job lists to our slob-like children in hopes that someone remembers to clean something up someday. No wooden frame in the shape of a cutting board. 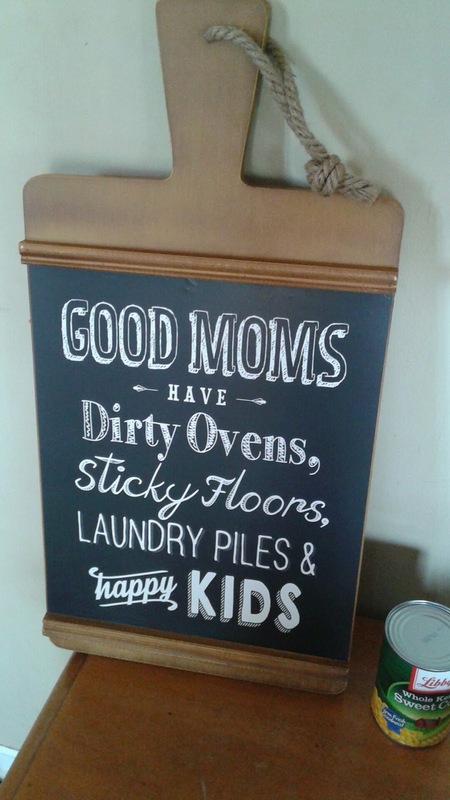 No faux chalk board. No chance of adding aesthetic value to our kitchen. I called my mom after I unwrapped the gift. 'Any idea why Aunt Patricia sent me this gift out of the blue?' I grilled her. After I read her the verbiage, she admitted that her sister had shared her plan to order me the decorative wall hanging (with a bit of bite). She assumed that Aunt Pat just thought of me when she saw it. Awesome. Just as I suspected. A woman, who wasn't searching for a gift for me, purchased a cute 'don't-fret-about-being-messy' wall hanging for me because it had my name written all over it. Sweet. 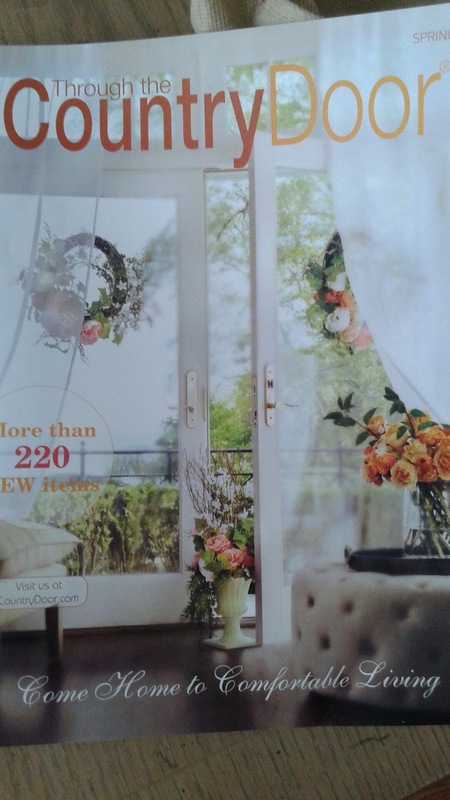 Nothing says 'I love you' like a gift that points out your poor housekeeping habits. Older message was blending in. And 'Happy kids' - I don't know about that. They are happy at times . . . like when I'm not home and they log unprecedented hours on Xbox. Or when I drag in $400 worth of provisions from the grocery store so they don't starve. My absence also creates a blissful environment because no one is around to remind them to tackle a chore off their list. When the coast is clear of their large and in charge mother, they are overjoyed to feast on food or inhale limitless snacks in rooms where munching is typically off-limits. 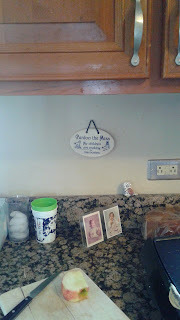 Just before I hung up with my mom, I reminded her that years ago Aunt Patricia gave me a small ceramic wall hanging. 'It said something about having a messy house,' I explained. 'I don't know what happened to it.' Mini was standing behind me, and she burst out laughing. She tapped me on the shoulder, 'It's hanging right there, Mommy.' I spun around and saw that she was pointing at it. How fitting that pasta sauce is splattered on the wall behind it. The original messy-mom house warming gift Aunt Pat sent me about 9 years ago was hanging smack dab in the middle of the kitchen wall under the cabinet that holds our dinner plates. 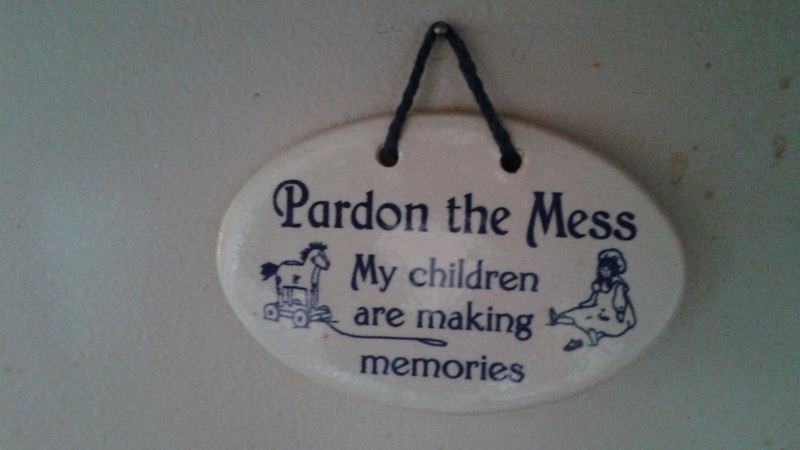 It reads, 'Pardon the mess, my children are making memories.' I guess it has been there so long, I no longer notice it. Good think I received a new LARGER reminder of what pigs we are - or more specifically, what a pig I am.